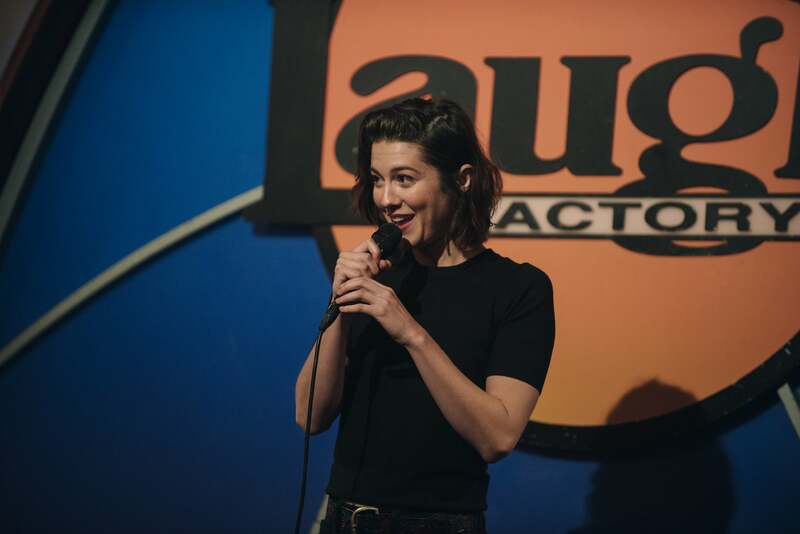 Mary Elizabeth Winstead is sitting in a back booth at Hollywood's Laugh Factory, opposite the infamous circular stage where so many stand-up comedians have made a name for themselves. In her new film, writer-director Eva Vives' All About Nina, out Sept. 28, Winstead plays one of those comedians, Nina Geld, a rising star who bares it all onstage but, due to past trauma, will not let anyone in her life get too close. When she moves to L.A. to audition for a Saturday Night Live-adjacent series, Nina meets Rafe (played by Common), a man who makes her want to confront her past abuse and work through her intimacy issues. The film is romantic and unsettling, tragic and, yes, funny. As for that last bit, Winstead, returning to the Laugh Factory on this recent afternoon, has no more desire to get onstage and perform a tight five but is content to be back in the audience. "Now? I'm like, No. I've done that," Winstead laughs, sinking back into the red vinyl. "I paid my dues, and now I get to not have to do that again." Instead, she may soon don purple leather as the superhero Huntress alongside Margot Robbie's Harley Quinn in the Suicide Squad spinoff, Birds of Prey. ET sat down with the actress to discuss All About Nina's unanticipated timeliness, the larger #MeToo movement and why she wants to be part of DC's all-female super squad. ET: What was it that grabbed you the first time you read this script, that made you want to be part of this film? Mary Elizabeth Winstead: My attention was grabbed from the first page, really. It's sort of different in the movie now, but in the script, it opened with, like, a three-page stand-up routine, which reads just like a monologue, you know? So, I thought, OK! This isn't just the wife or the girlfriend, this is something interesting, potentially. And with every page, it was more and more complex and fleshed out and intriguing and then, of course, by the end, just [an] emotional gut punch. I knew that it was something that I'd be lucky to be a part of. And then after meeting Eva and hearing her story and also hearing her vision for the film, artistically, it just was one of those things, for me, as an actor, I felt like I couldn't say no to. You're so rarely given an opportunity to be challenged at this level and to be part of something meaningful at the same time. Did you feel any trepidation seeing those three pages of stand-up? I tend to think of stand-up comedy as something, to a degree, you are either born to do or you're not. It takes a certain kind of person. What goes into learning to act that? It's tough because I feel like that's probably true, and if that is true, I don't feel like I'm one of those people that was born with that. It's a skill set that takes a long time to really master, so I had to truncate that mastering time and try, in my own way, to approximate what it would be like to be somebody who is a good stand-up comic. To me, that's somebody who is able to take an audience and really guide them, and guide their emotions and take them from laughing to feeling, like, kind of sick or whatever it is they're trying to do to get a response! [Laughs] That was something I was terrified to actually get onstage and attempt to do. Absolutely terrified. Did you have any sort of stand-up comedy boot camp? I watched a lot of shows. I went to a lot of shows. I listened to a lot of stand-up. Eva and I would get together and go to shows as much as we could. That's where we met Jamie Loftus, who's this great, young comedian who's also a survivor. She was our consultant on set whenever we were doing the comedy stuff. We went and saw her show. We went to more underground L.A. shows with lesser-known comedians, people who are just starting out, to get a feel of what that's like, so it wasn't all just super famous, well-known names. But at the end of the day, I realized it was a little overwhelming for me to try and emulate somebody else, especially because I think I could never be them because they're so amazing. So, I had to just figure out how to do it from myself and from what I think is funny, because otherwise if I don't think it's funny or I don't think I'm being funny, it's not really going to work. I can't just copy somebody else's cadence or style or whatever. I have to try to find it for myself. So, I sort of ended up focusing more on that and focusing more on who Nina was as a person and letting her comedy come out of that. I'm not sure how much of the stand-up material ultimately came from Eva's screenplay versus collaborating and improvising on set, but coming out the other end of playing a comedian, of having immersed yourself in this world, does any of that bleed into your own life, in terms of the point of view through which you see the world? Yeah, I guess so. Really, Eva scripted all of the stand-up stuff. There are for sure moments of improv and jokes that we collaborated on that made it in there, but the real structure of it was written by Eva. But it's a point of view that I think most women can get into, particularly if you are sitting around other women and playing off of each other. So, the three of us had so much fun getting together and we'd be here, just sitting up in the green room, making each other laugh, coming up with the grossest, meanest, sort of man-hating comedy we could possibly come up with. [Laughs] I think that for women right now, a lot of us can get behind that or can fall into that or can get a little bit mean or acerbic because we certainly have a reason to. So, I felt that. I tapped into that aspect of myself, for sure. It's kind of amazing, the timing, because we had no idea when we were making the movie that this movement was going to blow up in the way that it has. It feels really special. Now, it's not just one voice coming forward. It's like we're a part of something so much bigger and, hopefully, this movie will be a part of the legacy that is this time and this movement. We're all really excited about that, that it's such a symphony of experiences and voices coming forward and that we get to be, hopefully, a part of that that won't go unnoticed. If the story can connect with anybody who needs to see it, I really hope that they're able to see it and connect with it. I saw a little bit of that, too, I think. And brushing it off, saying, "It was 30 years ago!" I think this movie shows how that trauma stays with a person. This is what that might look like, however many years later, even if she never reported it. Absolutely. I mean, the shame that women carry when things like this happen to them is very real. I think the fact that we're having these discussions is really important and really amazing, that this is something that people are being forced to recognize, that this is a reality that people don't talk about what happened to them, people don't report what happened to them because of the way that our society is set up to shame people who have been through these things. I think now we're going, Wait, no, we don't have to carry this shame. Like, Actually, you're supposed to carry this shame, the people who perpetrated these things. Changing that dynamic, there's an uncomfortability in the air because of that, because change is hard. But necessary. And really exciting! I feel like this movie feels that way, sometimes. There's an uncomfortability about it because of what she's wrestling with, and I think that's a nice parallel to what's going on right now. In terms of Nina's trauma, is this the type of role you would do research to prepare for? Or are you able to pull from what is in Eva's script? We had Jamie and, obviously, this is Eva's story. So, I had her there every day. I tried not to pick her brain too much, because I didn't want to exploit her and what she's been through, but I trusted that if there was anything inauthentic about what I was doing, she would be there to guide me and to tell me what I needed to hear. Of course, knowing what she's been through and knowing what the character's been through, my empathy for that is huge, so it was pretty easy to connect with that and to go there emotionally. Your heart just breaks, just knowing that anybody's gone through something like that. And having Eva there, that connection was always there for me, so I didn't have to try very hard to feel that. But I did carry a little bit of the weight of wanting to really do it justice and to make sure it was right and was what she wanted it to be. "I think now we're going, Wait, no, we don't have to carry this shame. Like, Actually, you're supposed to carry this shame." I don't want to go into my personal life too much, of course, but I think just staying focused on what's important and what you know is true and the parts of your life that are real and authentic, which can be hard to do in today's social media, Instagram, Twitter world. I'm really lucky that I do something that I love, so I focus on my work and the people in my life that I love who are important to me and I sort of let everything else be noise. I am! Yeah, that's something that's just one of those things that's in the air and you just see what sticks. It would be really fun to be a part of, I think. I think it's a great group of people involved that I really admire. Are you a fan of superhero movies? Had you seen Margot in Suicide Squad? Yeah, yeah, yeah! I do think they're really fun, and this one, in particular, is really exciting because it's an all-girl cast being directed by a woman. There's not a lot in that world that is quite so female-driven, and the way that they're looking to do it and to go about it is really interesting and new and exciting, so that is something I'm very interested in. Is there something about the character of Huntress in particular that intrigues you? I shouldn't go there, because these things are so secretive! [Laughs] It's just for the best that I don't mention any particulars. But yes. Yes, absolutely. While you have worked on bigger studio films before, I tend to associate you with smaller, character-driven projects. Something like this, or like Smashed. As an actress, what do you get from doing a big budget franchise film like that? It's maybe a challenge that I welcome, in terms of trying to bring the same feeling that I get on these kinds of movies and transferring them to those kinds of movies. Because it's just harder, it is. They're so much bigger, which means they take so much longer to shoot. In a movie like this, you're doing 10 scenes a day and you're basically just living as the character and it makes it very easy to keep things alive and real. On a bigger budget movie, sometimes you're doing a scene over the course of two days, so you're getting into, like, half the scene in a day. You don't really get the same run-up, so the tendency can be to get kind of lazy and to sort of not try that hard. For me, it's a real challenge to still try to keep that feeling alive all the time. When you can go to your trailer and just order lunch. Yeah, when you just sleep half the day and are like, Uhh, call me when you're ready! That was something, in the last film that I did [the Will Smith-starring Gemini Man], that was a big, big part of it. It was a big action movie but it was directed by Ang Lee, who expects absolute authenticity and truth out of your performance. So, you're doing these action sequences and scenes where it's being shot so slowly, and it's so difficult to keep your creativity flowing and alive, but you know that you have this incredible artist directing you who expects that of you. [Laughs] That was a really rewarding experience for me at the end of the day, to know that I, like, made him happy, you know? Everyone has a different challenge about it, I guess. I can find something exciting about each of those challenges.